Who wants to suffer through boring, impersonal e-learning courses that aren’t relevant to their professional lives? Most learners don’t like click-next courses that make them feel invisible or fail to address their specific needs. That’s why engagement and motivation are so important. And an easy way to increase learner engagement is to give learners opportunities to personalize their learning experience. One way to personalize courses is to refer to the learner by name throughout the course. This is easily achieved with a simple text entry variable that’s called each time you want to address the learner by name. A more advanced solution is to design adaptive learning paths to accommodate different needs of learners. 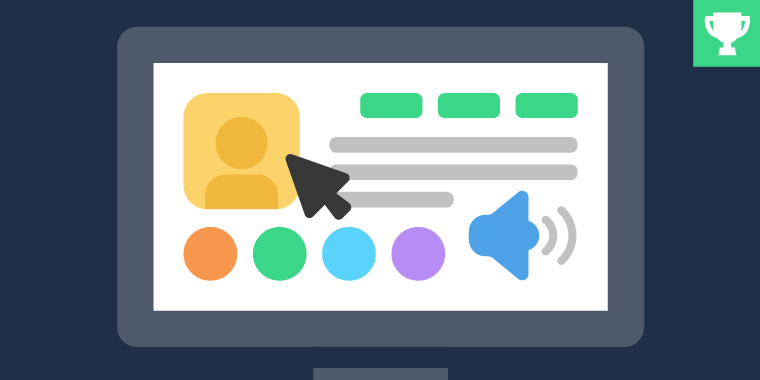 Whether you attempt a simple or more complex design, your goal should be to move beyond the one-size-fits-all approach that’s common to most e-learning courses. How you do that is what this week’s challenge is all about! This week, your challenge is to share an example that demonstrates one or more ways to personalize an e-learning course using gamification techniques. You can use a real-world project you’ve built or a quick demo you mocked up for the challenge. Wishing you a personalized week, E-Learning Heroes! Great contribution Michael! Nice customized learning paths. I appreciate you sharing the mind behind the magic. Great article! Thanks for sharing, Michael - very interesting idea. And you're right - sometimes complex solutions with a lot of triggers that are not visible to the eye don't seem to be impressive, although they are! I always liked this one, very creative. That is really cool! I like how the drag-n-drop makes it a conscious decision for the user what content to view! Nice variety of interaction Michael! Great interaction, Michael! I like the fact that I could customize the order of the presentation! Thanks everyone for the comments. It's good to see that this 'old clunker' still generated some interest. Great work Jerson! Quick question was the "speaker" a video recording that you inserted? I really liked the immediate feedback and updates. Thanks Yeal, The speaker scene was animated in After Effects and then imported into Storyline as a video. I really like the idea. Thanks for sharing. Great job, I had fun! I also enjoyed the animated character at the end. I love how you gave immediate feedback with good alternative questions to the inappropriate question options! Need help with troubleshooting basic computer problems? Check out this sample job aid that uses scenarios to walk you through the process - https://dl.dropboxusercontent.com/u/93703519/Basic%20Computer%20101%20-%20Storyline%20output/story.html I hope you can make these customers happy! Enjoy! Tania, I really liked the player here, and the color scheme you used. I've been trying to get more creative with the player recently, nicely done. What program did you use for the audio and also is there a sound option with the markers you used in Storyline? I liked the sound effect. Hi Dawn, Thank you. It was a quick sketch up. I usually look for sound effects from SoundBible or another site like http://www.freesfx.co.uk. In this project I meant to credit http://www.freesfx.co.uk. The color for the player was one of the default ones, I think it was Medium Blue. Very nicely done Maija! The balance in your layouts is always impeccable. Excellent work Maija. I love the clean design. This was very well executed. I like that you showed the branching overview, Maija--very interesting! Very nicely done... The final slide explaining the different pathways etc was a great idea! Da da dada! Fun Alex! I love the Music and timing. It's difficult to get back to work after watching that Alex! Love it - the count down on each slider is so Bond. Love the Map interaction. I was thinking about something similar! The traffic lights as a progress indicator is a great touch in your theme. So nice Paul and thank you very much for the source! Really nice, Paul, and I appreciate you providing the source file! Gamified Compliance Auditor Training, updated for Challenge 134: http://goo.gl/WgUrfz This is an update of Challenge #93, Grabbing Attention and Motivating Learners in E-Learning, which was my very first submission to the Articulate Challenges. I've included a color scheme choice. That was a fun suggestion--I've never done it before! I like this concept. The opening is really engaging. Some great ideas in there Tracy! You're good! Really like this - looks different with a great layout! I like that the learner has control of the environment. Simple and Perfect course Julia! Love the soft colours Julia and concept! Thank you! I don't get a lot of opportunity to play with color at work (corporate colors only), so I've been trying to branch out during these challenges. Beautiful, Julia--I didn't see any problems with artifacts at all! I like the comic style presentation. I used a similar look on a scenario project I just finished recently and it was very well received by the client. Love your scenario and chosen lay-out. I think you could drop the arrows pointing to the next buttons. People will get that. Hey, I really missed you all in the past few weeks. I have had so much going on. Most importantly final prep for my trip to Italy this week. I hope to view some of the fabulous posts and provide feedback. See you when I get back! This looks great! It's simple, effective, and contains good information. I love how the look of it matches the content too. Amazing player with a nice gamification effects. This is a great example of gamification - having fun while learning something. I really like this Sam. I develop a lot of IT Security courses and this has given me some ideas. Thanks for sharing. A fun demo, and now I'm a passwords expert! I also like the app-style Linda! Clever content, Linda. I have been trying to explore more ways to display devices such as phones and tablets in my work since I do a lot of technology training. Nice example. Very nicely done Harshal. Engaging and educational. I love the way the first panel moves to the side. Amazing! Also very cohesive design! Very nice looking. Really enjoyed the style. Very fun to use and the theme was great. I like this one Saurabh! Thanks Daniel! Yes it is different & catchy. Nice portable font game Jeff. Nice one Jeff. Eish . . . all these fonts usually mess me up! I just tweaked it so the timeline would actually pause when the user clicks a button and the audio played before jumping to the next slide! Really nice game, Jeff, even though I feel cheated out of an iPad! I also did a mock-up of a past challenge (the one on the spelling bee), which I originally created in powerpoint. I enjoyed creating this one - http://bit.ly/please-spell-it. Hope you do too :) Comments welcome! Great work Daniel. I really like the character style. Good use of timer Daniel! Nice. I could also see something like this working where the user has to use the scrambled letters to form the word answer. Really fun, and as a former English teacher, I'm glad I scored 100%! Hahahahah.... English can mess me up sometimes with the 'ce' vs 'se' words and the 'ie' not 'ei' as in review etc. Glad you liked it Tracy! Hi everyone! Here's a game I created for a grad school project: http://chilp.it/bb75735 It features many of the techniques mentioned in the challenge including: choosing your own avatar, customizing your name, allowing users to choose elements relating to design and audio, and you get to create a playable game prototype at the end! (Note: make sure to click the game window first, in order to play the game demo). Great job Ben. I liked the ability to customize your team. I also found out two new game development software that I'll have to try out when I finally decide to build my game. Really liked the last slide where you gave the option to research the different design companies/programs. That was a great option. I really like this! I see it as a really awesome alternative to just a reading list. (The reading in the computer) Thanks for sharing! This is great! I love the inventive use of sounds! I can't get this to work Nancy, I tried it on 2 different browsers. I enter my birth date and it says, "Your are: NaN" and nothing else happens. How are you entering your birth date? The format is 01/01/1989 Month first I think. Which browsers are you using? My fault, wrong order. This is very cool! Loved the creativity in this! Some of the text on top of the last screen was cut-off for me? Either way, was a great activity. HI Dawn , thanks so much! I did the text on the last screen like that intentionally. Maybe it wasn't such a hot idea. I see why the signage was cut-off for the stage effect. BTW - It added a year to my age. That's okay, I enjoyed it either way, loved the options, and the audio options especially. So much fun Nancy! Great idea having us select what we want and then seeing the final result. This was really fun, Nancy! I can't seem to try out your entry. Something wrong with the link. Nevermind, I just had to copy and paste the link. Another great entry from the the even greater Nancy W.
Thanks Jerson, you made my day! Love the creativity Nancy... It showed dd/mm/yy but I had read the comments to see it was mm/dd/yy. . . But it still missed my age, or don't I know how old I am? And I like the text off screen idea too... Made it look like a wall paper sort of! LOL, I am so confused. It is set to day/month/year. When you put it in as month/day/year the calculation is off. I have to take a look at the code again. Ok, I think I fixed it so that either dd/mm/year or mm/dd/ year work. But I really should test it more. Hi Nancy! I really enjoyed your example! Could you please share the secret how did you do this? I mean how did you manage to count my age by the date of my birth! This would be awesome if you could chare it. Thanks a lot! Liked the sliding characters and was also at a good pace. Did not keep the user waiting. Enjoyed the illustrated backgrounds also. I'm back! http://melslearninglab.com/ELH/story/story.html I should mention you can click on things in the room. Nice one Mel, have you ever seen the game Myst? It kind of reminds me of that! What font did you use for your variable input text? I used Arial for mine an noticed it looks broken up. I am seeing the same thing in your example. Arial used to work fairly well in the past. Well done Gemma, the use of the video in this course is very engaging. Welcome to the challenges. I liked the video also. Seemed very realistic and not over-produced! Nice entry. I was not sure of how it ended, but either way, great design. Welcome to the challenges, Gemma! I'm so glad you shared this week. I just updated the recap to feature your example: https://community.articulate.com/articles/ways-course-designers-personalize-learning-experiences#GemmmaWells Thanks and hope to see you around future challenges! Nice work! Simple and attractive with a focused presentation; easy to understand and use.